Prompting an uneasy nerd truce of the type that would be explained in an opening crawl, or by dumbing down complicated sci-fi terms into into an easy analogy, The Hollywood Reporter says that the first trailer for Star Trek Beyond will premiere alongside Star Wars: Episode VII—The Force Awakens on December 18. That means Star Trek fans and Star Wars fans will have to set aside their deep-rooted differences and try to co-exist for at least a few minutes while they wait for the trailer to be shown. Once they’ve seen it, though, Trek fans will be able to leave the theater, freeing up their seats for remaining audience members to put down their toy lightsabers, vintage Stormtrooper helmets, and whatever other cosplay crap they brought along. However, trailer-loving Trek fans shouldn’t leave too early, because THR notes that a bunch of other movies are expected to have teasers before The Force Awakens, including Batman V. Superman, X-Men: Apocalypse, Independence Day: Resurgence, Captain America: Civil War, Finding Dory, The Huntsman’s Winter War, and The Jungle Book. 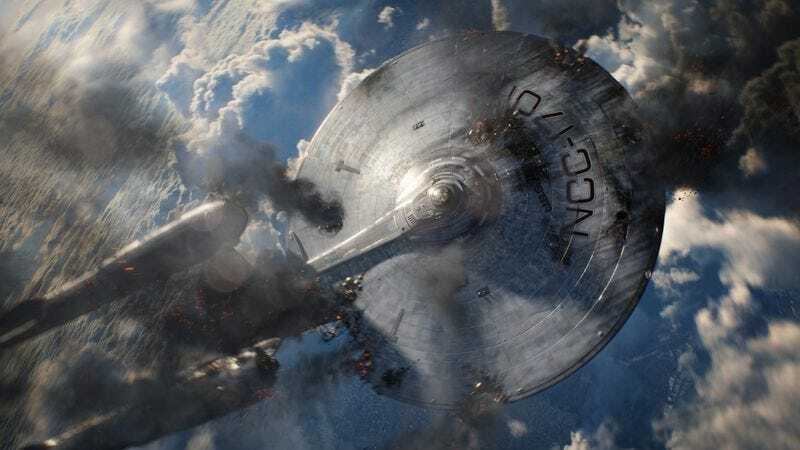 It sounds like only Star Trek Beyond is confirmed, but none of the studios behind those other movies are going to miss a chance like this, either.